Here’s another device I’m happy to give a perfect score of 10 for ultimate portability. It fits in the palm of your hand while offering a number of storage connections. I’m talking about the new Crystal Acoustics PicoHD 5.1 Media Player, and it’s anticipated to attract movie buffs, travellers, and most especially, to users who need media on the go. So what makes this little star shine big? Read on! If you’re a traveller who frequently stays in hotels, you either have to rent a media player or use Pay-Per-View to be able to watch movies. Crystal Acoustics has utilized USB technology to create a media player that can connect to a multitude of USB storage devices. As a result, with this mini movie player, all you need are your favorite movies stored in your SD, SDHC, MMC cards or USB flash drive. 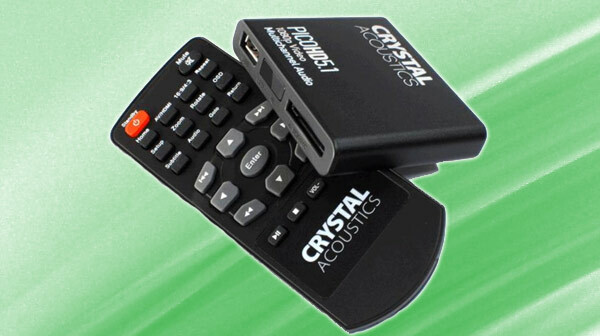 Similar to a small pocket dictionary with a size of 2.95” x 2.5” x 0.59” and a weight of barely 2 ounces, the Crystal Acoustics PicoHD is wrapped in heavy-duty aluminum and functions like your normal media player except that it plays full HD 1080p HDMI output for a wide variety of file formats for your videos: MKV, DIVX, XVID, AVI, M2TS, WMV9, MPG1/2/4, FLV, RM, TS and VOB. It also supports FLAC, MP3, AAC, OGG, WMA and WAV for audio files. The media player, however, is not WiFi or Bluetooth ready. To use, just insert your storage device and then hook up the HDMI port into your TV or receiver. And for the audio, you can enjoy its multichannel 5.1 coaxial audio feature which will allow you to play your audio separately to a 5.1 receiver. Since the Crystal Acoustics USB pico player is too small, the media player has no screen, so you wouldn’t be able to see the interface. To operate, there’s a remote control that’s slightly bigger than the player. If ever you leave the remote control at home, you can still operate the player using a universal remote control and even program its commands. Crystal Acoustics says the new Crystal Acoustics PicoHD 5.1 is coming out in a few weeks, and will be priced at $83. We think this kind of technology is worth the price, what do you think? Don’t forget to share your thoughts! This entry was posted in USB Devices, USB Gadgets, USB Media Player, USB Technology and tagged Crystal Acoustics, Crystal Acoustics PicoHD, Crystal Acoustics PicoHD 5.1, Crystal Acoustics PicoHD 5.1 Media Player, Crystal Acoustics USB pico player, PicoHD 5.1 Media Player, USB Media Player. Bookmark the permalink.